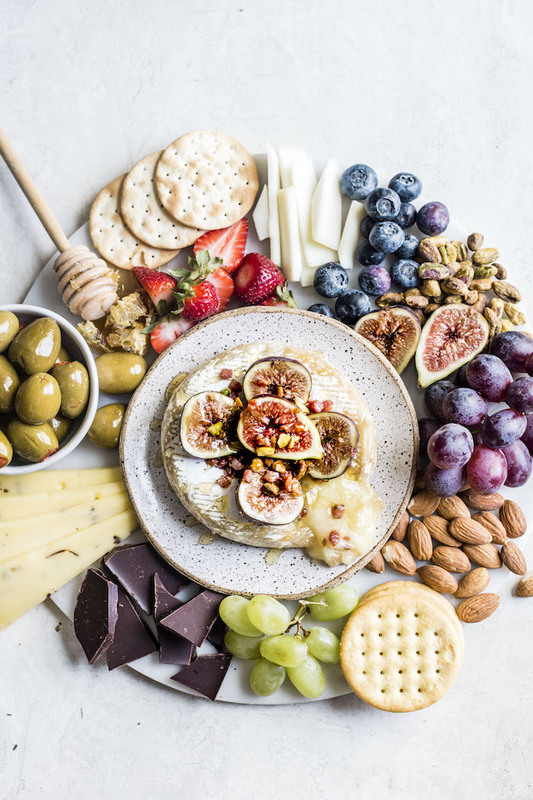 This Summer Cheese Board is packed with all the necessities, like cheese, crackers, fruit, and plenty of wine, along with a tasty baked brie recipe that’s topped with figs, pancetta and pistachios. Ohhhh yeah we’re doing it! It’s almost May which means it’s practically summer, and I’m so, so excited for warmer weather and summer get-togethers. 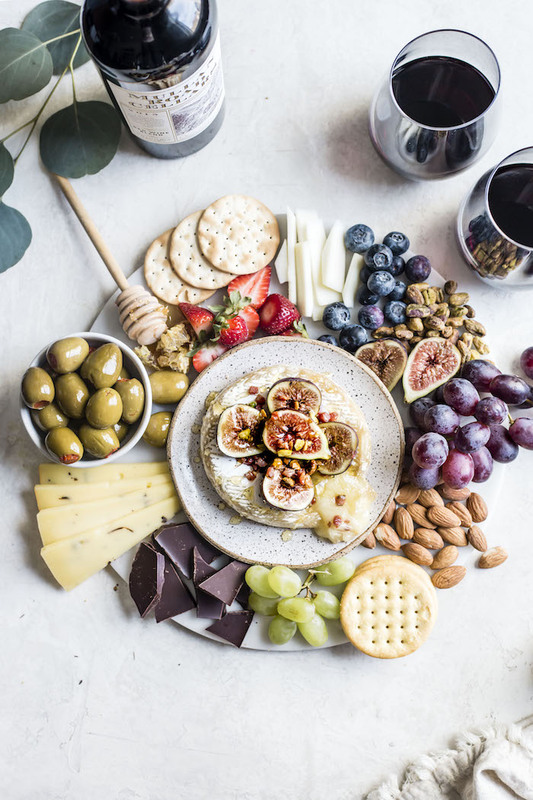 Though it’s common to whip up a bunch of recipes before friends come over, it’s almost easier to just throw together a cheese board and call it dinner. ….which from my findings, most people are totally ok with! Also it’s Monday sooooo…. no matter the weather, a cheese board is absolutely in order. This cheese board is on the smaller side, making it perfect for a simple hang out vs. a large outdoor party. But, it features all the goods, including WINE from Mullan Road Cellars. Honestly, what is cheese without wine? They’re meant to be together, and the Mullan Road Cellars Red Blend pairs perfectly with red meat, heavy cheeses and grilled veggies. 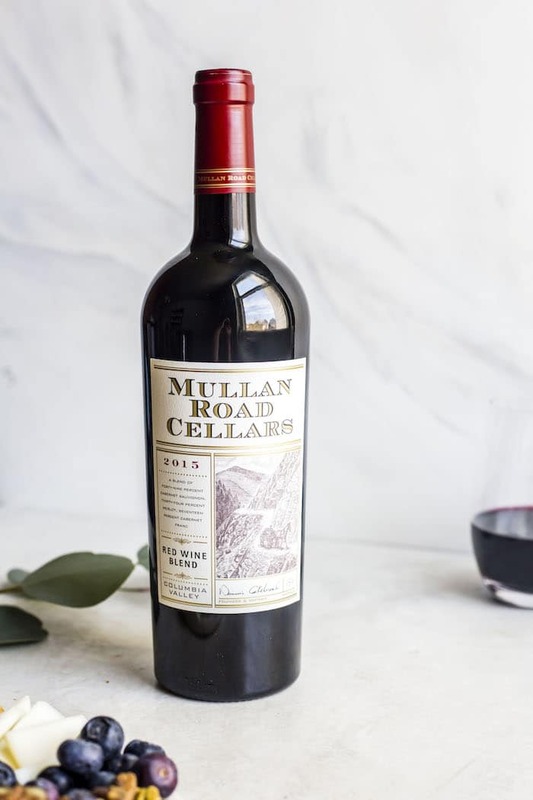 Mullan Road Cellars is a small production project outside of Washington state led by Dennis Cakebread–yes, THE Dennis Cakebread of the iconic Cakebread Cellars in Napa Valley. The Red Blend is a blend of Cabernet Sauvignon, Merlot and Cabernet Franc, with fruit from vineyards in the Columbia Valley. If you’ve never made your own cheese board, I feel like they can be a little….intimidating. But have no fear! They’re actually quite simple to throw together, which is why I want to go over these summer cheese board necessities. First, you need cheese (obviously). I used two types of gouda, and then brie cheese, which I baked to perfection, in the middle of this board. You can find the recipe for the baked brie below! Second, you need wine. Yes, this is the second most important thing, and I honestly can’t recommend Mullan Road Cellars enough. Third, you’re going to need some crackers. I usually buy a variety pack at the grocery store—just something to use for dipping purposes. Fourth is some fruit! 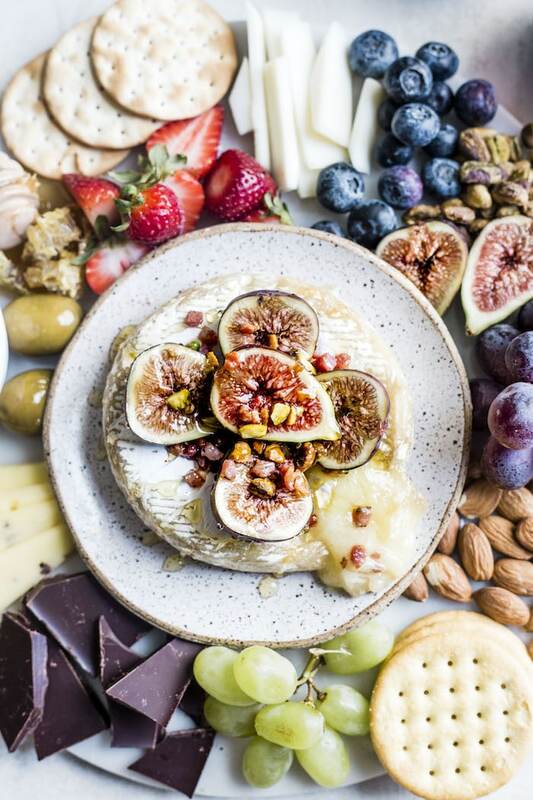 Since this is a summer cheese board, I opted for strawberries, figs, grapes, and blueberries, but feel free to use whatever fruit you like best. The last few items I included are nuts, honey and chocolate. They’re not all necessary, but they do help make the spread look pretty (plus you gotta love honey+cheese and fruit and crackers). So what are you waiting for? Now’s the time to show off your cheese board-making skills, wine and all. To learn more about the Mullan Road Cellars Red Blend, click here. Disclaimer: This post is sponsored by Mullan Road Cellars. As always, all opinions are my own. Thank you for supporting brands that help make this site possible! Place baked brie on a nonstick baking sheet and top it with the figs. Bake brie for 10-15 minutes or until the cheese is soft. While brie is baking, cook the pancetta over the stovetop with a little bit of olive oil (or oil of choice). Once brie is baked, carefully transfer it onto your serving dish, then top it with the pancetta and the pistachios. Lastly, drizzle it with honey. I think this is the most attractive cheese board I’ve ever seen!! !